NEWFOUNDLAND, Britain's oldest colony, became Canada's newest province in 1949, and since then Canadians have enjoyed gently mocking this 42,500sq m island off their east coast as a cultural backwater. Now "Newfies", as the locals are known, are having the last laugh as British property buyers discover one of nature's more stunning playgrounds, only five hours across the Atlantic. The Appalachian mountain range and dense pine forests stretch across the island, itself scarred by spectacular gorges and fjords carved by ancient glaciers. Wildlife, such as moose, caribou and eagles, call the forests home, while in spring, humpback whales cruise off the coast en route to their breeding grounds. Newfoundland's natural beauty is complemented by more practical considerations: it has a low crime rate and cost of living, and its small population (485,006) is known for its hospitality. Newfound Developers, owned by local businessman Brian Dobbin, has got behind the island's potential and created Humber Valley Resort on the island's west coast, 10 minutes from Corner Brook, its second city. Chalets are set around Deer Lake and the resort includes an 18- hole golf course, three restaurants and an activity centre. The lake is known for its summer salmon fishing, and residents can also go hiking, mountain biking and kayaking during the warmer weather. An average winter snowfall of 16ft makes alpine and cross- country skiing at nearby Marble Mountain some of the best in eastern Canada; winter temperatures average minus five degrees Celsius, making Newfoundland one of the country's warmer spots. If you need a rest from all this outdoor activity, you could take in the view from the balcony of one of the resort's attractive, clapboard chalets - each set in one- to two-acre plots with an average of 2,000sq ft to 4,000sq ft of living space. Otherwise, you could buy a plot of land - with either lake, forest or mountain view - and choose one of the 15 chalet styles available. All the 321 plots released in the first phase have been sold; the resort's 10-year master plan is for 1,000 chalets in 2,400 acres. Plot prices range from £156,000 to £735,000; building costs are between £173,500 for a threebedroom lakeside chalet and £382,000 for a 5,000sq ft Cedar Falls-style chalet. Entry- level prices, including land clearance, average £350,000. Early buyers have seen profits of up to 150% in three years, and now there is a weekly charter flight from Gatwick into Deer Lake airport, 20 minutes away, returns could be higher. Margaret Budgell, director of property sales, says prices are lower than comparable fourseason resorts elsewhere in Canada. "We plan to sell only 100 properties a year and expect an annual 10% capital appreciation for the coming years," she says. Most buyers place their property into a rental pool to avoid paying 15% harmonised sales tax (HST), a tax which limits personal use of the chalet to 10% of the year. "We predict a 30% to 45% rental occupancy, which - with average chalet expenses around £5,900 per annum - should see most owners breaking even," says Budgell. She anticipates a four per cent to six per cent rental return, but not for at least 18 months. New plans to build 24 condos priced from £176,500 have attracted the current crop of owners. Future plans include a spa and second golf course, but it is the area's natural beauty that will entice many. Newfoundland bills itself as "God's secret"; the secret is out. Buying at Humber Valley Resort. Capital gains tax is 25%. Harmonised sales tax, a tax of 15%, is payable in Newfoundland on buying a property for private use. If homeowners put the house into a rental pool, using it only for 10% of the year, it is classified as a commercial property and not subject to the tax. Financing is available for up to 65% of the price. Newfoundland has no estate duties. For more details on Humber Valley Resort, (from UK) call Newfound Property International on 020 8605 9540, or visit www.humbervalley.com. 'Within 24 hours we fell in love - first with the resort, then with the people, and then with the area' WHEN Daniel and Kate Gray chose to downsize from London to St Albans two years ago, it gave them the financial freedom to buy a second home abroad. 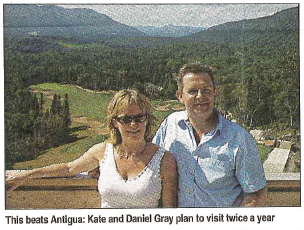 The couple considered destinations as diverse as France and Antigua before visiting Humber Valley Resort and knowing it was for them. "We looked at Humber Valley Resort determined to make a hard- headed business investment," says Daniel, 42, a telecoms marketing manager. "Within 24 hours we fell in love - first with the resort, then with the people, and then with the area." Daniel and 47-year-old Kate, who owns a courier company, are building a five-bedroom Lakeside style chalet, which is due for completion by Christmas next year. There are various places to stay in Humber Valley, including of course Humber Valley Resort, Steady Brook, Corner Brook, Little Rapids and Pasadena. These range from Challets, Inns, small Hotels and Bed and Breakfast (B&B). Search google to find what you're looking for. We suggest you always book online - its cheaper!